A little quickie love bird. I'm hoping if you click on the link below, and maximise the page, you will be able to print off the right sized template for this birdie. Gawd knows how long I spent trying to sort out a pdf for this, and then gave up, so hopefully inserting it as a file will suffice.If it doesn't you can scale up this (click on the picture to make it bigger). Stitch one piece of plain fabric to one piece of patterned fabric along the long edge, repeat, then fold your 4" square of fabric in half and press as shown. I've lined the body pieces with a medium weight cotton to make it nice and sturdy, just stitch together along the edges and trim. Don't do this to the pocket which is shown on the left. Pin and stitch around the template on one piece of your plain/patterned fabric. This will act as a guide for your applique and subsequent stitchery. (Sorry about the crappy photo). Flip over, and following your previous stitch line, stitch the pocket to the main body. I made my legs a bit shorter after I'd taken this photo, but it's entirely up to you how long they are. Now pin your two body pieces right sides together, and stitch together just inside your original guideline leaving a gap to turn. Trim and snip close to your stitch line to make it more bendy. Turn right side out, and stitch gap closed. 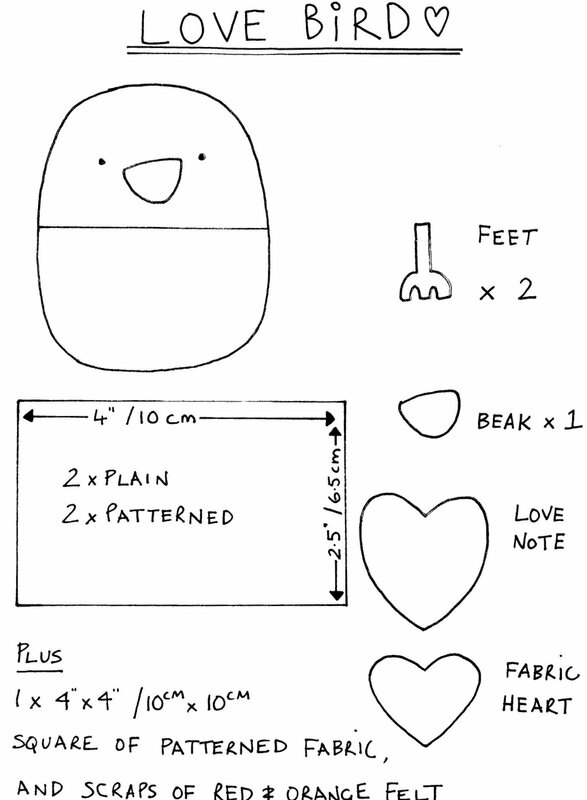 Make some little paper love notes using the bigger heart template, and a fabric heart using the smaller template and pop into the pocket (or you could suggest to your loved one that this would be a very good place to hide a lovely surprise diamond ring for you). As usual, I suspect this tutorial rambles on, but I hope it makes sense, do let me know if not. SOOOO CUUUTE !!! Think I'm going to try to make it for Saturday ! THANKS !!! That is soo lovely! My girls are gonna love me (even more), if I make them this little tweety. probably will never attempt it but thank you for making me think i can!! you are one clever little chicken. A lovely diamond ring? I need to work that angle. wow did i leave the first comment? What a cute tutorial !! oh, I want to make one! well, actually I'd have to make two. Thanks for the tutorial. I love this! Thanks for the tute! Aw, Lyn the boidie is so sweet! Thanks for posting the pattern - it's great to see you back! So cute and very good of you to share it, I'm going to have a go at this tomorrow, it will be the perfect distraction from what I should be doing. Thanks for the tutorial. I just made it for my little girl for Valentines Day. She will LOVE it. wow. seriously cute overload. i'll be making these fo sho! Utterly gorgeous, and not in the least rambling! I love it. Very very cute (but we expect no less!) Thank you for sharing it with us! Wanted to say a HUGE thanks for the tutorial -- I have already made some of your hedgies and even altered it to make some owlies! You are very creative and I can't believe how easy you have made it to make these wonderful softies esp the pockets! Thanks for sharing your creativity! You're a genius! very, very, very cute. thanks for the tute. Oh, how sweet! I've got to make one. I love him! He is so cute. so darn cute!!! i'm going to have to try to make some of these. thanks for the tutorial! Pretty blog and lovely tutorial!! !, are a great source of inspiration. I also finish to open my store: http://a-ma-shop.blogspot.com/, you do not doubt in visiting me to say to me “Hi”. Greetings from Spain. too bad I don't have time to make them this year but I have bookmarked you ! I love your tutes and I am wondering what hapened to my comment? Did I offend someone? I apologize...I saw my comment then it disappered. I didn't need another project... really! But my daughter would be in heaven if I put everything aside and made her this sweet bird. Must! Thanks, thanks, thanks for the tutorial! I've been wondering what I'm going to do for my daughter for Valentine's Day! Please have look at our birds as well see if it is as cute as yours! So nice of you to do this for everyone- thank you! I am going to make one of these cute chics for my daughter who loves and droools over all your stuffed babes! So simple, but so cute. I'll tell her it's from your tutorial and that will have her over the moon. That is SOOO sweet! I love this! Thanks so much for sharing the pattern, I'll be linking. What a cute chickadee! Thanks for sharing this! oh, i love it!! thanks. quick, easy, cute. love it !!! i just finish made two for my kids!! so cute! So cute!!! Thanks for sharing - I'll be making a few of these in the morning! that is sooo cute, will definately try . thankyou for your neverending delightful works you share with us . clever clogs you !!!! So cute!!! Thanks for the tutorial. I would love to make it! she is cute!! thanks for the tutorial! So sweet!! Thanks so much for all the wonderful tutorials. I just happened to make my friend a panda and a chick and she fell in love them!! Thank you for this - i have made one already - it's just too cute! I have made mine and she is sitting on our bed for hubby to find today with a love note and a trail of choccie's to a treat. This is so cute! Thank you! I must make one! This love bird is just soo cute! I'm gonna try to make one too! Thank you so much for sharing. Here's wishing you a very merry happy LOVE day and a merry wonderful LOVE weekend! Lots of LOVE to you and yours! I love your beautiful cute creations! They are so sweet. Glad you are back and gave us this bird. I think this will be my Sunday activity! Thank you! thanks! I made two, one for my little boy, one for my little girl. my son is sleeping with it tonight while my little girl has placed in on her special shelf. thanks for the totally cute idea. I admire you! You make lovely things. this is a darling bird. thank you for the tutorial! Lovely tutorial. I loved them so much, that I whipped up 3 for my favourite valentines on Friday night. Thanks so much for sharing. I really enjoy your tutorials! Thanks so much for sharing them. What a neat chickie! I used to make a babydoll sorta like that and folded blanket behind her head and across her bottom. The kids loved it. My name is Bev and I am a Grandmother waiting to become a GG (great grandmother) in a couple of years. My grandson is getting married in June and they both want to have children (lucky me). I dropped in to tell you about Wool E. Woola, a picture book about a sweet BIG dog, that I wrote and illustrated. A friend put up the money and we set up a publishing company, just the 2 of us. Please check it out at www.moonbowpress.com If you like the book or the site, please tell your friends. I love it ! Thanks for the Tutorial, i will share this with other friends that love birds ! Darling. Can't wait to make one of these for my 6 yr old for easter! Thanks! That is too cute! You make it so easy. Can't wait to try my hand at this one! That is one of the cutest things I have ever seen! Wow! Thank you for the tutorial, it's great! so sweet! Very cute, i think I may make a family of these for little Easter treats, if I can part with them. Thank you again for a great tutorial! I made this lovely bird yesterday just to cheer me up. And it sure did. Thanks! My daughter Asha loved making her lovebird, she's eight and loves your site. She even made her lovebird a little house and bedset! Adorable!!! I will have to make some for next year's valentine's day. Thanks for the tutorial. Okay, I'm a newbie to sewing, but I think I could do this because it's small (I don't have a sewing machine). You don't show a picture of the back of the bird. Is the whole back the solid fabric, or is it half and half like the front? Is there a pocket in the back? This is such a gorgeous, creative and inspirational blog! I love it! Thanks for posting this tutorial up! Excited to try my hands at this! This is most amazing!! Thanks!!! Oh man!!! This is so frickin cute! I can't believe I only JUST found your blog. BOOKMARKED! Thanks so much for your amazing artiness & inspiration! I love your blog and get very inspired by it. Thank you so much for sharing your thoughts and ideas. Aaaaaawwww! He is just too CUTE!! That's it, my little chickens NEED some little chickens. It just has to be done. Thanks Molly Chicken! I made one--just because it is so cute and because I am new to blogging and wanted to learn how to share a link. Let me know if it is not okay; I will remove immediately.